In February of 2015, Senator Robert Wittman of Virginia introduced H.R. 872 through Congress, seeking federal recognition for Virginia tribes, and last month the bill passed the House National Resource Committee. The bill affects a little more than 4,000 Native Americans, encompassing the Chickahominy, Eastern Chickahominy, Upper Mattaponi, Rappahannock, Monacan, and Nansemond Tribes in the state of Virginia. These Virginia tribes are state recognized, but not yet federally recognized. If bill H.R. 872 passes, then the tribes would be granted access to rights and laws afforded to all federally recognized tribes, including a government-to-government relationship with the U.S. and eligibility for funding and services from the Bureau of Indian affairs. Among other things, this would include protecting their fishing, natural resources and lands. These tribes have been working toward federal recognition since 1990, or even earlier — recognition long overdue considering their rich history. The Pamunkey Tribe was the first in Virginia to earn federal recognition, and that only happened last year, on July 2, 2015. The Chickahominy Tribe has over 800 members today, and has resided on their ancestral lands since the 1600s. The tribe lived alongside the Chickahominy River, where they were close to the English settlement of Jamestown. During the original settlement, the Chickahominy traded food for goods with the people of Jamestown, and later taught them how to farm the lands around the settlement. When the tribe signed a treaty that forced them out of their original homeland in 1646, they were compensated with other land. Another tribe, the Monacan Indian Nation, is one of the oldest indigenous groups still living on ancestral homelands, and at least as far back as 1607, they lived along the falls of the James River in Virginia. The Monacan Tribe makes up more than half of the state-recognized Native population, with more than 2,000 members; this number may be even higher, as many people were not allowed to register as Native American for the 1930 Census. Although small, these tribes have some of the strongest roots in the state of Virginia. The passage of H.R. 872 would grant the same benefits to these tribes as to all federally recognized tribes – except Indian gaming would be prohibited. The bill recently passed review by its sub-committee (the House Natural Resource Subcommittee on Indian, insular, and Alaska Native Affairs), in which case it may soon be submitted through the House and Senate for approval. Federal recognition would be a significant and just win for these the tribes. Some sources estimate 220 or more tribes are unrecognized, and dealing with policies such as recognition has been said to be degrading. A member of the Shasta Tribe of California was quoted as saying, “I’ve been told to my face that I don’t exist, that I’m extinct. It’s demeaning and humiliating. It’s degrading.” The disregard of such tribes seems like the cause of their “disappearance” in today’s age. 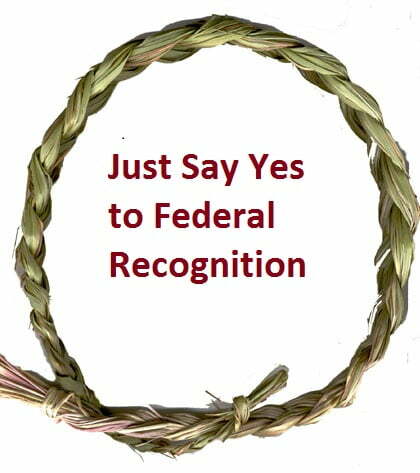 Federal recognition for any tribe helps them be known by the mainstream for their culture and helps the tribe continue to exist in unity and, hopefully, thrive. This entry was posted in Humanitarian and tagged Chickahominy, Eastern Chickahominy, federal recognition, Jamestown, Monacan, Nansemond, Native Americans, Pamunkey, Rappahannock, tribes, Upper Mattaponi, Virginia. Bookmark the permalink. Trackbacks are closed, but you can post a comment.